Janet Napolitano, the University of California's 20th president, will deliver the annual Peltason Lecture at UC Irvine on Tuesday, May 6. Appointed to her post in 2013, Napolitano leads a university system with 10 campuses, five medical centers, three affiliated national laboratories, and a statewide agriculture and natural resources program. The UC system has more than 234,000 students, about 208,000 faculty and staff, more than 1.6 million living alumni and an annual operating budget of more than $24 billion. 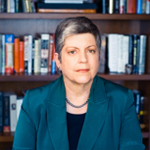 Napolitano's visit to UC Irvine is sponsored by the UC Irvine Center for the Study of Democracy. The Peltason Lecture was established in 1999 to honor Jack Peltason and his wife Suzanne. Peltason was the 16th president of the University of California (1992-95) and UCI's second chancellor (1984-92). "The Miracle in Our Midst"
This event is free and open to the public. RSVPs by May 1 are required for attendance. Check in for the event will begin at 2:15 p.m. Identification matching the reserved name will be required in order to gain entry. There will be no re-entry allowed once admitted into the auditorium. Backpacks are subject to search. Parking is available for purchase in the Student Center Parking Structure (grid D5, bldg SCPS). For further information or to RSVP, please contact Shani Brasier, sbrasier@uci.edu or 949-824-2904.